These articles provide basic information and helpful recommendations concerning data access and recovery. Buffalo Technology provides a wide range of NAS solutions for personal, home and small office use. These devices offer space-efficient shared storage with access over a local network. Unfortunately, despite enhanced reliability of modern network-attached storages, they still remain exposed to failures and data loss. This article describes data recovery methods from popular 4-disk Buffalo TeraStation solution of Bufallo Technology using UFS Explorer RAID Recovery and is also applicable to LinkStation Quad NAS. Warning! The instructions below assume that you have basic skills of manipulating hard disk drives. Any physical damages to the storage medium may cause permanent data loss. If you are not completely sure about your competence in working with hardware, please, turn to a data recovery laboratory. Accidental deletion of important information by user mistake. RAID5: This configuration the most widely-used one. Data is distributed across the drives and is protected by RAID5 ensures good operational speed and the ability to use 3/4 of storage capacity. The information remains recoverable even without one drive. RAID10/0+1: Data is distributed across one pair of drives and is mirrored on the second pair of drives. RAID 10/0+1 ensures good operational speed, high reliability and enables the use of 1/2 of storage capacity. Data remains recoverable after the failure of one drive; if two drives fail simultaneously, the chances for data recovery are close to 67%. RAID0: Data is distributed across the drives. This configuration ensures maximum operational speed and maximum use of storage capacity. The failure of one drive results in the loss of all data. JBOD: Data is spanned across all disks. This ensures the ability to use the full storage capacity and quite good performance. Failure of one drive results in the loss of all data. Multi-part storage:Each drive has its own dedicated file system which is mounted under a dedicated 'share' folder. Failure of one drive results in the loss of the 'share' folder on this disk. In case of hardware failure, other than hard disk failure, firmware failure or faulty firmware update the data remains recoverable regardless of the NAS configuration. NAS re-configuration usually causes partial data loss from previous configurations. For efficient data recovery from NAS SysDev Laboratories advise their UFS Explorer software. UFS Explorer RAID Recovery was specially designed to work with complex RAID systems. UFS Explorer Professional Recovery offers professional approach to the data recovery procedure. This software has embedded tools for RAID recovery. Other UFS Explorer products work with RAID systems via plug-in modules. Each of the software products applies powerful mechanisms, allowing you to achieve maximum recovery result, and are 100% reliable, guaranteeing complete safety of the data stored on your NAS. For more detailed information, please, go to https://www.ufsexplorer.com/products.php. Two drives failed in RAID10 (0+1). For multi-part storage partial recovery after drive(s) failure is also possible. As NAS devices don't provide low-level access to data, before starting data recovery you'll have to disassemble the storage and connect its hard drives to a computer for recovery. Please read HOW TO: Connect IDE/SATA drive to a PC for recovery for instructions. Mark the order of drives using paper stickers or a soft ink marker. In addition, prepare a safe storage on which you will copy the recovered data. Network drives or external USB drives are preferable. Figure 1. NAS drives in UFS Explorer RAID Recovery. An extended partition (a partition with sub-partitions) is a container and is not mentioned further on. Data (storage) partition.This partition contains user files. For RAID configurations data partitions of each drive are combined into a software RAID virtual device. Note: Depending on the retailer and the model NAS can contain from two and up to four partitions on each drive. Data partition is the largest partition (takes up about 95-99% of the entire disk space) and has no sub-partitions. For a multi-part storage or RAID1 a valid XFS file system will appear on the data partition of each NAS drive. For SPAN or striped RAID (RAID0, RAID5, RAID10) some data partitions will display 'RAW partition' as they contain no valid file system start. Before starting data recovery make sure that the order of NAS drives is correct. Please refer to How to identify NAS drives order from XFS NAS for instructions. Multi-part storages and RAID1 configuration allow for data recovery without RAID reconstruction. The XFS file system is detected on the data partition of each drive. If the file system is not detected on RAID1 or a multi-part storage you'll need to reconstruct the file system. To do this run "Data Recovery" scan enabling the 'File system reconstruction' option with the XFS file system. Step 1. Run the RAID builder dialog. Figure 2. Build RAID tool icon in UFS Explorer. Figure 3. RAID Builder tool in UFS Explorer. RAID5 is usually the default RAID configuration for 4-disk Buffalo TeraStation and is offered as default setting in UFS Explorer. RAID0 configuration allows for fast operations and maximum use of storage capacity. RAID10 configuration provides for fast operations, redundancy and use of half of the storage capacity. JBOD is a non-redundant configuration that has quite good performance and enables the use of full storage capacity. As a rule, the size of a data partition doesn't fit to the size of a JBOD component. Before you assemble JBOD, you will need to adjust the size of a data partition manually. This operation requires detailed analysis and is not described in this article. Step 3. File system detection. After assembly RAID appears as a Virtual RAID in the tree of storages. This storage contains one partition with the SGI XFS file system. If the partition is displayed as a RAW partition, RAID was assembled with a wrong configuration or drives order. Please check the order of drives. Double-click the partition to open it in UFS Explorer. If the software warns about errors, RAID was assembled with a wrong configuration. Please check the stripe size and the order of drives. After the scan is completed, you will find all recovered files in UFS Explorer. Note 1: If data loss was caused by NAS failure, your data gets accessible immediately after RAID assembly. No data recovery scan is required. If UFS Explorer warns about reading errors or doesn't show all of your files, check the RAID configuration. 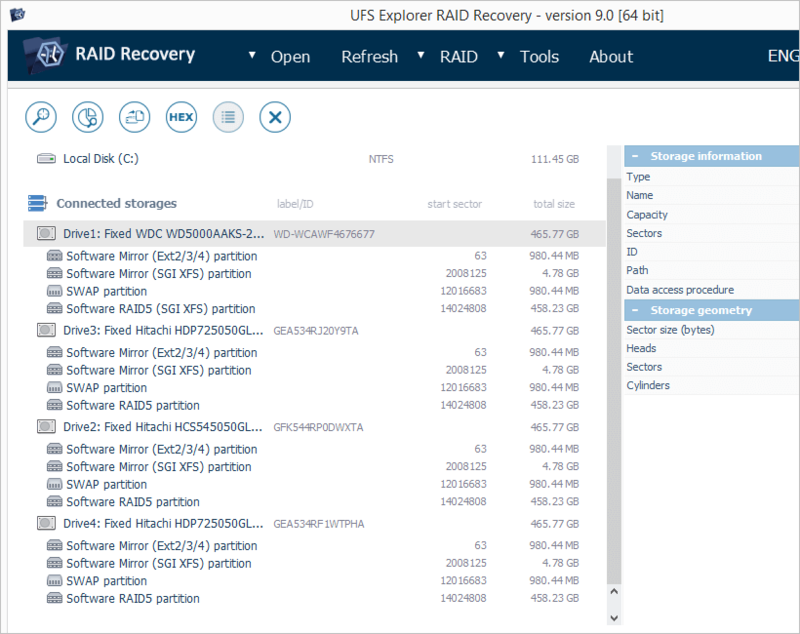 Note 2: If data loss was caused by accidental deletion of files, all the remaining data is displayed in UFS Explorer immediately after RAID assembly. To recover lost files select 'Recover lost data' in the context menu of SGI XFS partition of Virtual RAID in UFS Explorer. Note 3: In case data loss was caused by NAS re-initialization, if UFS Explorer reads the NAS correctly, but it contains only default folders, scan the XFS file system for data recovery. Note 4: In case data loss was caused by both NAS re-configuration and re-initialization, when you can see empty SGI XFS on RAID0 instead of expected files on RAID5, you may fail to recover the lost data correctly. We advise to use professional data recovery services. In case of any physical damages it's strongly recommended to bring your NAS to a specialized data recovery laboratory in order to avoid irreversible data loss. If you feel unsure about conducting data recovery operations from your NAS by yourself or not confident about the RAID configuration of your NAS, feel free to use professional services provided by SysDev Laboratories. For data recovery professionals SysDev Laboratories offers expert analysis of NAS on a commercial basis.